Experience in Software, Inc. of Berkeley, California, was founded in 1983 to support a book written by its founder, called “The Art of Negotiating”. As a tribute to the book’s success, The Art of Negotiating became the name of the company’s first software product. Experience in Software’s core business model is creating solutions to increase business productivity. It primarily develops software for managers, entrepreneurs, and other professionals. The company’s customer base is wide, encompassing business, education, government, and non-profit companies. Experience in Software’s key product is currently Project Kickstart Pro 5, a project management software solution. Project Kickstart Pro 5 makes project creation easy with the ability to drag and drop whole libraries into a new project. Project Kickstart Pro 5 is designed for easy integration with the Microsoft tools, allowing users to import from an Outlook address book into the program. Create visual project outlines showing all phases, tasks, and notes. When starting a new project, Project Kickstart Pro 5 wizard will walk the user through six simple steps to brainstorm and organize plans. The streamlined question-and-answer process can help members to fully develop a framework, identify potential problems, and find solutions. 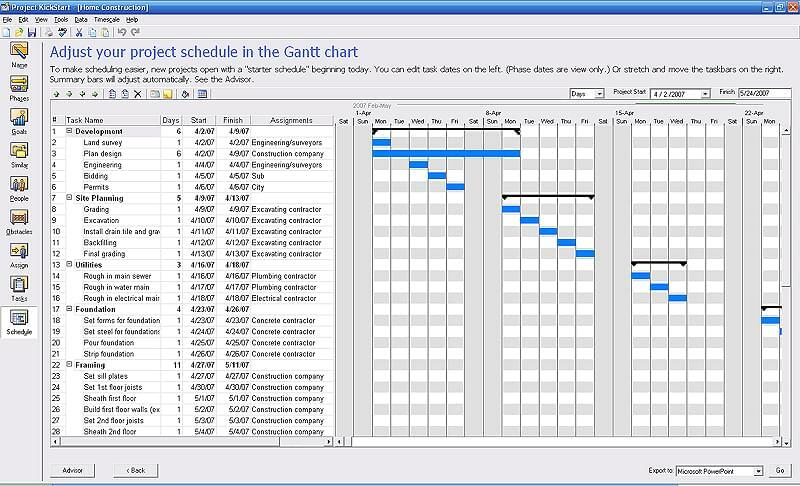 Offering user-friendly simplicity in project planning software, overall project reporting and individual task reporting tools are built into Project Kickstart Pro 5. Dashboard reports make it easy for managers to see what is due and when, from tomorrow’s deadlines to quarterly or annual tasks. Report saving capability enables those managers to look both forward and backward in time to see trend development. Importantly, tools to identify dependencies between tasks are provided. Project Kickstart Pro 5 project management software is available today as a free trial from TechnologyAdvice. Learn everything you need to know about Project Kickstart Pro 5. Our experts will reach out to you shortly.